Bordallo Pinheiro is a ceramics company from Portugal with a long and proud heritage that began with artist and nineteenth century political disruptor, Raphael Bordallo Pinheiro. He’s now known as one of the most influential people of nineteenth century Portuguese culture. In 1884, he began a ceramics production in Caldas and the award winning and much copied home wares of Bordallo Pinheiro were born. 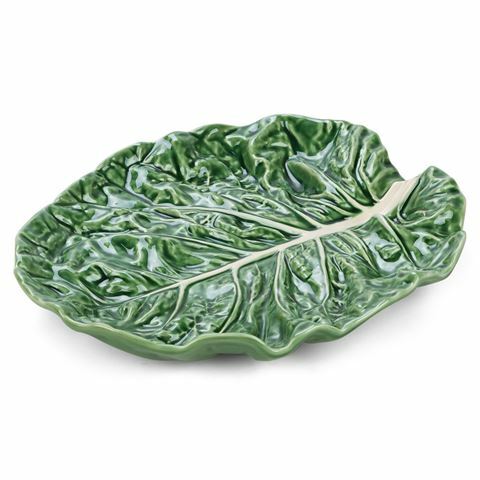 One of the signature collections is Cabbage, which was a way for the designer to thumb his nose at society by featuring this lowly but beautiful vegetable on their refined dining tables. Nobody could resist it because seldom has the cabbage motif looked more inviting. Bordallo Pinheiro - the natural beauty of Portugal on a plate. Made from glazed earthenware with hand painted features. Pleasing shape of a cabbage leaf will enhance the look of food. Fruit will look extra lush in this bowl, it's the perfect summery feel. Mix and match this collection with other vegetable or plant based plates for a unique look. Stamped on the bottom with company logo.